Finally, I'm starting showcasing officially my Mary Blair pieces! I had a light ankle sprain last week overlapping my allotted time to take these photos, so I needed to delay this post a week. (I did consider doing these photos in an ankle brace but I figured what's a few more days of waiting...?) Anyway, THIS was one of the skirts that I HAD to have! When the Magic of Mary Blair Collection released the photos of the pieces, ALL of them were lovely. But after waiting the month or so for the collection to be released I couldn't get the Commuters print out of my head. The background color was so unique in that I next to never see olive skirts in vintage reproduction land, but the boldness and unique sketching of the people or "commuters" was also like nothing else I had ever seen. 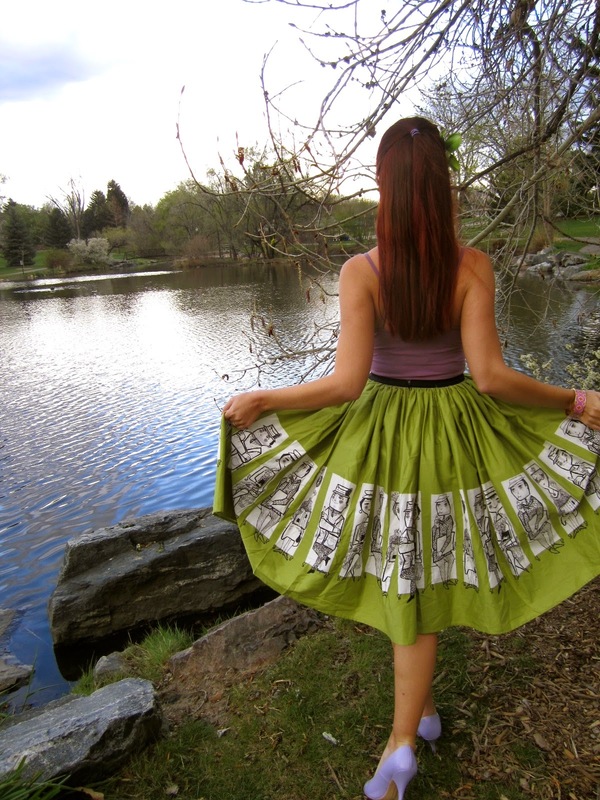 A lot of reproduction dresses and skirts are made to look like actual prints and pieces from the mid-century but I have yet to see anything that is remotely like this. I love every piece of clothing that I have. I bought them for a reason and I tend to hold on to clothing because I borderline collect clothes. That said, some pieces of clothing rise above the rest. This skirt is beyond a reasonable doubt one of them and that became clear to me the moment I tried it on. I legitimately did not want to take it off! This very well could be my favorite piece of vintage reproduction clothing ever!! Part of why I love this skirt so much are the exact reasons why I wanted it: it's like nothing else I've ever seen before. 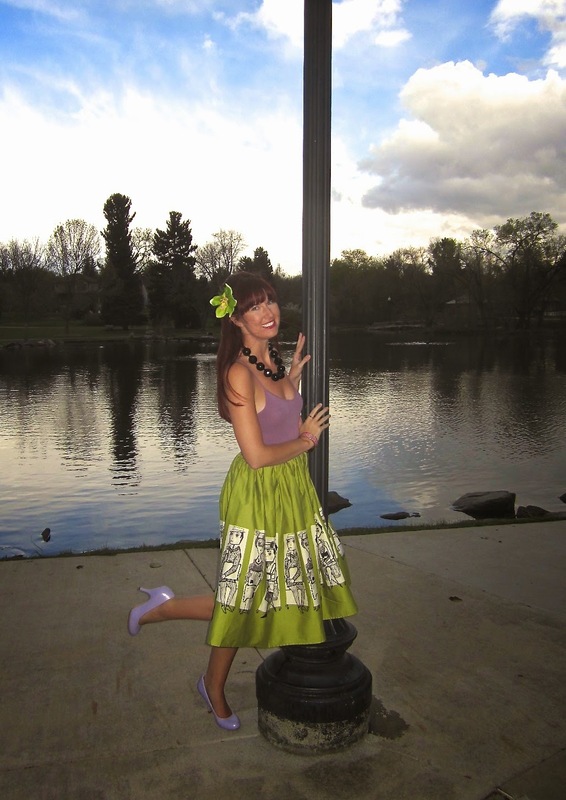 It's part midcentury and classy and part the kind of skirt I could take to a rock and roll concert and not stick out. A little funkier than most 1950s/1960s inspired fashion perhaps? Thank-you so much, Pinup Girl Clothing, for putting out such an awesome piece amongst such an awesome collection!!!! Oh man! I hope someone returns it and you snag it up or find it on eBay! Thank you!! These pictures are so lovely! I especially love the one where you're sitting next to the water. That commuter skirt is to die for. I LOVE the new Mary Blair collection. I'm hoping on getting at least one of them sometime soon, my eyes are on that train print Jenny! And, I hope your ankle feels better! Ankle sprains are the worst. Your style is everything, such pretty colours. Plus you shine so bright! love this, the skirt is so pretty and unique! You're right. That skirt is one-of-a-kind. Adorable print! Also, I love this unexpected color pairing. I'd never think to put these colors together and they totally work!